Hugh Freeze celebrates with his defense after a late-game interception. 2 The series between Ole Miss and Alabama started in 1894, yet the Rebels had never beaten the Crimson Tide twice in a row. But that changed on Saturday with the Rebels' 43-37 win in Tuscaloosa. Chad Kelly posted 341 yards, four touchdowns and was part of one of the most incredible touchdown plays all season. Ole Miss had 433 yards on 64 plays, compared to Alabama's 503 yards on 100 plays. The Rebels recovered two fumbles off special teams and forced three interceptions, including one in the final minutes to stop a potential Alabama comeback. The Rebels earned their first road victory of the series since 1988. They also handed Alabama its first loss in September in 29 games. Alabama's last September loss was in 2007 to Florida State. 37.3 Bowling Green wide receiver Roger Lewis gained 261 yards on just seven receptions, averaging nearly 37.3 yards per catch in the loss to Memphis. His yards were the second-most in school history and seventh-most in MAC history. Lewis leads the nation in receiving yards with 510 yards and five touchdowns and earned MAC Offensive Player of the Week. 96.0 Georgia quarterback Grayson Lambert set an NCAA-record by completing 96 percent of his passes in the Bulldogs' dominating 52-20 win over South Carolina. 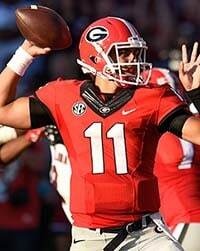 The transfer completed 24 of his 25 pass attempts for 330 yards and three touchdowns. His completion percentage broke the previous 95.8 percent record set by Tennessee's Tee Martin (1998) and West Virginia's Geno Smith (2012). 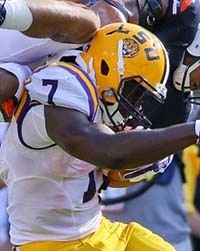 228 Leonard Fournette has been an unstoppable force for the LSU offense and Saturday against Auburn was no different. The sophomore had a career-high 228 yards, including a 71-yard touchdown run on the Tigers' first play from scrimmage. The sophomore averaged 12 yards per carry -- a new LSU single-game record -- and had most rushing yards for any running back coached by Les Miles. 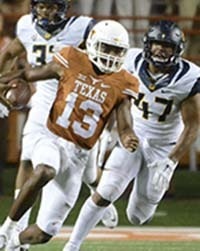 527 Texas quarterback Jerrod Heard collected 527 yards of total offense against California for the most by any player in Longhorn history in a single game. The freshman quarterback completed 20 of his 31 pass attempts for 364 yards and even led the team in rushing with 163 yards and three touchdowns. Heard led the Longhorns from a 21-point deficit in the fourth quarter, where he scored two of rushing touchdowns. 1950 Tennessee scored touchdowns on both a kickoff and punt return for the first time since 1950. Evan Berry returned a kickoff for 88 yards with 45 seconds remaining in the first half and Alvin Kamara took a 50-yard punt return to the house in the second half. Kamara become the first Vols player since Stanley Morgan in 1975 to return a punt for a touchdown and rush for another touchdown in the same game. 2-13 UConn converted only two of its 13 attempts on third down. Ohio State also did the same against Northern Illinois. ... 3 Steve Sarkisian has lost three games to unranked opponents during his time at USC. ... 4 UCLA starts the season 3-0 for a program record fourth straight season. ... 5 Miami's Michael Badgley went 5-for-5 on his field goals including the game winner in OT. ... 7 Oklahoma State forced seven turnovers against UTSA, five of which were fumbles. ...10 Missouri is the first SEC team to score fewer than 10 points in a win since 2011. ... 10 Florida State has allowed only 10 third down conversions on 45 attempts all season. ... 19 Louisville's offense was held to only 19 rushing yards in the loss to Clemson. ... 41 BYU held the ball for almost 41 minutes compared to UCLA's 19 minutes. ... 216 Georgia Tech's triple offense was held to a season-low 216 rushing yards. ... 300 Ohio State finished with less than 300 yards for the first time under Urban Meyer 792 Arizona set a single-game record with 792 total yards of offense. They also had school records with 499 rushing yards and 77 points.